This dialog box is displayed by clicking "Fonts and colors" in Options → Preferences, View section, "Tree view settings" subsection. It allows the specify the fonts and colors used to render a tree view. Note that the sizes of the fonts used to render a tree view are not specified in this dialog box. Instead, they are specified by "Base font size". Click on a numbered link in the top pane. 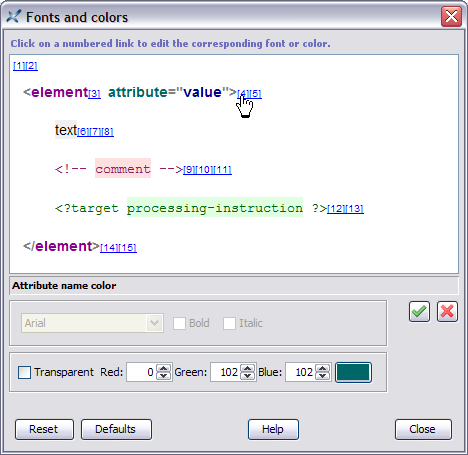 In the case of the above screenshot, the user has clicked on  which corresponds to modifying "Attribute name color". Doing this activates a font chooser or a color chooser in the bottom pane, depending on the kind of property being modified. In the case of the above screenshot, "Attribute name color" is a color, therefore the color chooser is activated and the font chooser is grayed out. Note that some colors are allowed to be transparent (background and border colors) and some are not (text colors). For example, if you specify Transparent for "Attribute name color", an error will be reported. Specify a font or a color. The top, preview, pane is automatically updated to reflect your choice. Discard all the changes. Revert to the initial fonts and colors. Discard all the changes. Revert to the default (that is, “factory”) fonts and colors. Most foreground colors are also used by the "XML source" view. The font family specified in item  —comment, processing-instruction and verbatim text font— is used as the (only) font family of the "XML source" view. The font styles (bold, italic) specified in item  —markup font— are used as the font styles of the markup in the "XML source" view.